In 2013, The Register began its travel series Geek's Guide to Britain. Today, that series is available as a book. The inspiration for our series were the scientists, engineers and inventors born or working in Great Britain who made their mark on the world. Jet engines, the internet, medicine, electricity, mass communications, aerospace – there’s little these brain boxes haven’t transformed through their touch. From the university-educated Victorian to the entrepreneurial maverick chappie, from the immigrant unwanted in their homeland to the visionary armed with nothing more than some grit and a car load of old army radar gear, the brains in Britain have simply cracked on. They’ve hollowed out mountains and created man-made lakes, they’ve tamed The Thames, and defeated enemy aggressors using aircraft and mathematics. Their legacy runs beyond simply their creations; it embraces a network of towers, factories, bridges, tunnels, bunkers - and more - across the UK. The concept for Geek’s Guide to Britain was for a travelogue, a handy set of family friendly travel guides around the UK’s places of invention and creation past and present, from lost gems to sites of technological wonder, from functioning facilities to hidden museums. 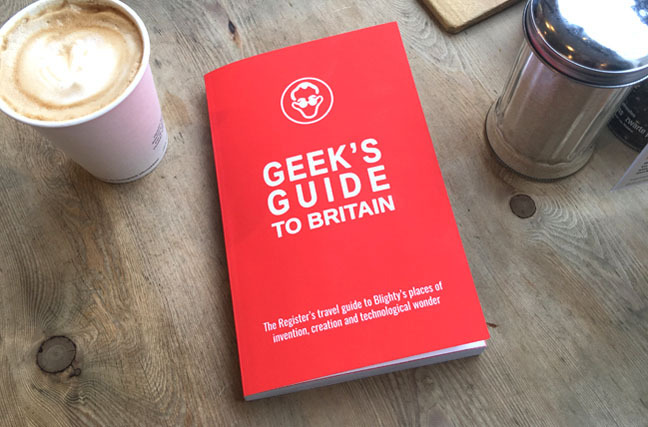 With our book, you are no longer dependent on a functioning internet connection to read Geek’s Guide to Britain or A4 print-outs. Geek’s Guide to Britain comes in a handy back-pocket-backpack-handbag-car-glove-compartment-sized format. Already featured in The Guardian, our book covers 26 destinations spanning the country from Goonhilly Satellite Earth Station on Cornwall’s remote Lizard Peninsula, Jodrell Bank all the way up to TAT-1 in Scotland, scene of the first transatlantic telephone call. Our book packs the series' facts, figures and history together with practical details, from getting there to where you should eat and stay to help you plan a trip.